This was truly my mother’s last journey. It started in the morning with her urn placed deep into my backpack. On top of the urn I added the polished mahogany box containing my dog Sunny’s remains. Hoisting the whole heavy pack, I walked out of the hotel to rent a car. No excuses acceptable. I had a letter dated Sept 15, 1994, in which she outlined her plan to be buried with her parents in the Canby City Cemetery. The letter was heavily noted with her thoughts about a new granite marker including her name with theirs to be placed at the burial site. Her wishes could not have been more clear, though foreshadowing her dementia, she had misspelled her father’s name. Soon she was off my back, in the rear seat of a sleek black Volvo. I had flown to Minneapolis knowing I would drive to Canby to bury my mother and my dog in what I regarded as my last act of care for my mother. At first, I had a hard time with the thought of burying her so far from California, but it was my mother’s wish to be laid to rest with her parents. Family though we are, we are not grave visitors by any stretch of the imagination. Peace came to me in a very simple plan. My mother loved our black lab, Sunny, who had died within days of her. There were times when she visited our house and, silent in dementia, stretched a hand taking up one black ear between thumb and forefinger, rubbing and humming to the dog. She was at our house, but visited only the dog. While she had lived in California for her last seven years, it made sense to place my mother according to her wishes in Canby, and to place Sunny with her there as an eternal reminder of her West Coast family. On a crisp morning, the day after arriving in Minnesota, I got directions and left Minneapolis listening to Coltrane and wondering why every city I visit has better jazz radio than the Bay Area. At first my excitement was palpable. I had told myself this would be a pretty straightforward trip. By Eden Prairie, only about 30 minutes into my journey, I was short of breath, signaling my old sidekick, anxiety, rising in my stomach. At the turnoff toward Shakopee/Chaska, white noise usurped Coltrane; I hit the radio’s seek button in my rental. Jim Morrison turned up immediately, and I set a course for classic rock as long as I could get it. It was clear that this drive was not going to be the California freeway experience I live. Nor would it be a midwestern toll road experience. Four lane roads quickly became two lane county roads. I was alone for long stretches, unchallenged by a single car in either direction. Crossing the Minnesota River for the first of several times through towns, population 1,323 or less, I slowed to the 30 mph speed limit. Gone was the notion that I’d drive the 164 miles in less than the four hours Mapquest advised – I understood why the time estimate was so long. At the point where I was to turn left on Flying Cloud Drive, I messed up and had to backtrack on the freeway, sudden tears blurring the road ahead. Memories of my childhood took me to Chicago’s State Street, eternally embarrassed by the ankle-high shoes my mother insisted I wear until I was around four. My mother had spent most of her life in Chicago, until I had moved her to California because of the worsening dementia. We stopped for a smiling exchange with Mrs. Emkie, a blue-haired lady my mother knew casually. Simultaneously, I had tugged harder, tilting myself at an angle away from the conversation. My mother relished comments like Mrs. Emkie’s, taking them as a reflection on her. She flashed her most generous Hollywood smile, digging her fingernails into my hand to prolong the moment of appreciation. I think she loved me until I got a mind of my own. She did her best; I know that. As a teenager, no longer little and cute, I argued every chance I got. She taught high school and surely understood something about teenagers. Sometimes I didn’t come home, preferring to stay with friends in the suburbs. As a mother, I would have been beside myself and filed a missing person report. She didn’t. Perhaps she trusted me. Perhaps she knew the days of controlling me with her fingernails were long gone. We shopped, went out for hamburgers, and she laughed at my running commentary on politics and people we knew. Although she had a life before me, she had made me a centerpiece of her life until I escaped. As a result, I didn’t begrudge the weight of her urn or the drive. As the corn towered over each side of my car, I reflected on my single-mindedness about returning her to Canby. Canby is her place, not mine, but it holds some shadowy foundation for my origins. Driving that two-lane road, I was newly aware of my own passage into a place where I was in some way rooted, connected to people and lands I never knew. Their legacy formed me as surely as the people of those lands formed those before them in earlier years. The rural road narrowed again and meandered. Verdant grassy ditches dropped at each side of the concrete. Cornfields stretched just feet away on either side. It felt like my car was lifted, floating on a sea of corn in every direction. I grabbed my camera, snapping a shot of stalks towering over the car on each side. The sameness of the terrain meant that the only way I could know when to turn was by setting my odometer and paying close attention to sparsely marked county road signs. Lulled by the sea of vegetation and the road’s gentle curves along the fields, I jolted to a stop realizing that I’d missed a turn by three miles. Doubling back, I reset the odometer and panicked when my turn didn’t come up at the three mile mark. I was out here in the middle of nowhere. Not a person, not a house in sight. If my turn didn’t appear, I wondered if it would be better going on or going back? And where was the closest help? I imagined being stuck in the birth canal faced with the impossibility of turning back, waiting for the next push toward light. To my relief, my turn appeared on my left. I was very close now. A road sign welcomed me to Yellow Medicine County, named for the bitter root of the Moonseed plant with its crescent-shaped seeds and narcotic flowers used by local Dakota and Sioux tribes for medicinal purposes. Toxic in the wrong hands, it had healing properties for a wide range of ailments. Tea made from the roots was used to treat indigestion, arthritis, bowel disorders and as a blood cleanser; the root itself was used on chronic sores. I had visited this place forty years ago as a teenager and before that, as a child. Recognizing nothing, I continued to follow directions, setting the odometer at every turn. At last another sign welcomed me to Canby, home of the state’s wrestling champions. I turned left on the main street and left again into the funeral home. Her beefy frame looked comfortable in jean shorts and a 50’s sleeveless blouse. Her short hair was pinned babydoll style to one side. We sat down at a round pine table with country kitchen chairs to compare notes on granite color, engraving, and floral decorations in the corners of a new grave marker. I asked if she knew the family that had purchased the farm my family had owned until twenty years ago. She brought out a phone book the size of a thin paperback novel. Each section listed the names of people in a single tiny town, ten towns in all. I found the name and address, and asked for directions. I wanted to return to Minneapolis by dinnertime, but just maybe I’d drive by. I followed her Suburban onto the main road through town. Old brick buildings along the main drag offered up one theater, an Ace hardware, a health and yoga studio, and some other small stores. A wide-windowed diner that Toni recommended for lunch stood opposite a millworks and lumber yard. We drove on, soon arriving at a cemetery flanking both sides of the road. Toni turned left, and I followed, stopping behind her at the side of the dirt path. Many tombstones bore the family name, but Toni led me on foot to a spot in the middle of the cemetery where a hole awaited. I looked around at the sparkling granite garden, and then down. How do you know who is in which spot? I wondered. I gazed down at the square pit at my feet. We both eyed the spots where my grandparents lay beneath the grass. I thanked her and turned back to my car to retrieve the urn and the box. 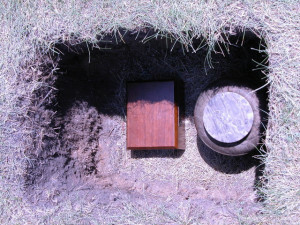 One in each arm, I returned to the hole, first placing the urn and then the box. They looked very small. There they were. My mother and my dog, at rest at last. I looked to each side of the open hole. This was the closest I would ever come to my grandparents. “My grandparents.” Foreign and wonderful words. A concept made real in a cemetery. I had grandparents. And for that matter all these distant cousins – blood relatives under those granite tributes. My grandparents would finally share a granite marker with my mother. I went back to the car for my camera. This is their place not mine. I snapped pictures of the urn and box in their resting place, several small monuments bearing the family name, relatives, and a wider angle of the cemetery. That’s all I needed. I turned away but after a moment turned back again imagining the north wind, the banks and drifts of snow, spring rains on fledgling corn stalks, forebears more than a century ago erecting barns, pounding timbers to form houses, and before them, the people who lived on these lands and cared for it as their own – before our Scandanavian families settled here, the generations of native peoples who coexisted, hunted, farmed, and fashioned their life against harsh elements. Where are their bones, their markers, the places where their legacy can be honored by modern generations? My heart filled with all these images, newly connected to this land and the generations of people who made a home here, made a home in my imagination and heart. I turned left on the main road in the direction I’d been told. Six more miles. I had the time. At the hilltop Toni described, I turned right on the small county road and began marking the dirt road “streets” that materialized exactly every mile. I found the one and turned. “First place on the left,” Toni had said. The name on the mailbox was right, but it was not the farm I remembered clearly from pictures and seeing it as a child. A man on a tractor worked empty land alongside a gravel drive lined with cars that led to a mobile home. I looked down the road at the next farm. That could have been the one. Lush trees surrounded what I remembered as the white frame two-story Victorian house that I had seen but never been in. I envisioned the chicken coop across from the house, behind that a barn and silo. Had they subdivided the farmland to make a homestead for this young couple? I did not drive on to look closer. This was their place now. I said goodbye to all of it – to the legacy of that land and earlier generations, to family that had never been mine – and turned back through town, retracing my route to this remote place, resolute that my place, my peace were to be found elsewhere. Mary Pacifico Curtis is the author of Between Rooms (2016) and The White Tree Quartet (2018), as well as poetry, and prose in the Rumpus, Crab Orchard Review and other literary magazines. She has had a Silicon Valley career in PR and branding, and venture capital. Mary lives in Los Gatos with her husband, two dogs and wildlife that shares their terraced hill.